Cover: Seated at the table is Madame Xanadu. 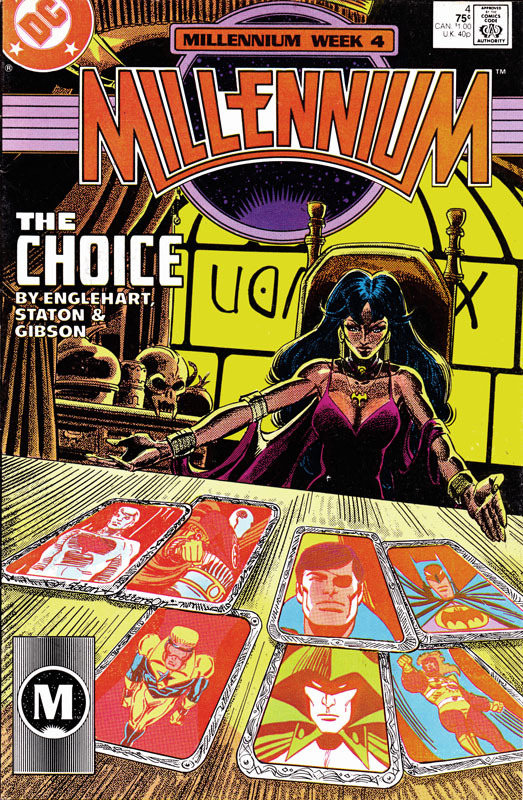 Shown on the cards before her are, left to right on the top row, Captain Atom; Deadshot; the Privateer; and Batman. On the bottom row are Booster Gold; the Spectre; and Firestorm. Top row: Looker; Geo-Force; Blue Beetle; Flash; Wonder Woman; Green Lantern (GL) Guy Gardner; GL Kilowog. Next row (to the right of the page): Black Canary; Green Arrow; GL Arisia; GL Hal Jordan; GL John Stewart; GL Katma Tui. Next row (the Chosen): Tom Kalmaku; Janwillem Kroef; Celia Windward; Takeo Yakata; Xiang Po; Betty Clawman. Next row: Wildcat; Floronic Man; Jade; Skyman; Mr Bones; with Hourman in front of them and Batman over to the left, who’s not happy. This page picks up straight after INFINITY INC #46 (as detailed in Crossovers Week 3) where the team captured the Floronic Man. Tom thinks “now all eight of us who survived being chosen are here” but only seven of the Chosen are shown; Gregorio de la Vega is not visible. Page 2 – Panel 1: Floronic Man is untied and can now join the Chosen. The “blue man” he mentions is the Guardian, Herupa Handu Hu. Page 2 – Panel 3: As Jade says, thanks to the Green Lanterns, everyone can now understand each other. I have to wonder what happens when the charge wears off or the Chosen aren’t near the Lanterns, though . . . Page 2 – Panel 5: Celia explains how the Guardians need different people. Her mention of Tom and his family refers to the events of GREEN LANTERN CORPS #220 shown in Crossovers Week 3. Meanwhile, Batman’s still not happy. Page 2 – Panel 7: Betty calls the others “eye-time people” – I’m assuming that’s the opposite of the dreamtime she normally concentrates on. Page 3 – Panel 1: And Janwillem Kroef shows off his racist attitude, hoping Flash will side with him. Page 3 – Panel 2: Thankfully, Flash puts him in his place. Page 3 – Panel 5: Batman helpfully recaps for us; Firestorm went bad in FIRESTORM #67 in Crossovers Week 1. Page 3 – Panel 6: Booster went over to the dark side in BOOSTER GOLD #24 in Crossovers Week 2. Page 3 – Panel 7: Superman’s problems were shown in SUPERMAN #13 in Crossovers Week 2, and ADVENTURES OF SUPERMAN #436 in Crossovers Week 3. Page 3 – Panel 8: Tawny Young appeared in the previous issue and was asked to broadcast Manhunter propaganda. Page 3 – Panel 9: President Reagan also appeared in the previous issue and wanted the heroes to speed up their dealings with Herupa Hando Hu and Nadia Safir. Page 3 – Panel 10: And Jim Gordon was found to be an android in BATMAN #415 from Crossovers Week 2. Page 3 – Panel 11: Batman remembers the Privateer – the man wearing the eye-patch in the pink/red headshots – who was also known as Manhunter for a while, and he has an idea. Page 4 – Panel 2: Batman checks the Green Lanterns’ computer and finds that the Privateer is being held in Belle Reve in Louisiana, when the Floronic Man was captured. Page 4 – Panel 3: “In the time it takes to order up a new STAR Labs jet” – exactly how quickly do STAR Labs deliver jets? Page 5 – Panel 2: The Manhunters have hostages – I believe this is the first time they’ve been mentioned. Page 5 – Panel 3: Firestorm arrives, carrying Bernard Ferguson who converted him to the cause in Firestorm #67 as mentioned above. The Manhunter on the left talks of other traitors who haven’t yet been revealed. Page 5 – Panel 4: Firestorm’s a “vegetable” following an explosion in his own title which has left Ronnie Raymond unable to directly control the Firestorm matrix. Page 5 – Panel 5: Dirk Davis and Booster Gold; Booster was convinced to go over to the Manhunters by Davis in BOOSTER GOLD #24 as mentioned above. Page 5 – Panel 6: The Manhunter mentions Booster attacking Harry Hadley which happened in the previous issue. Here Booster explains the reason he joined the team – Davis has swindled him out of all of his money and he’ll do anything to get it back. Page 6 – Panel 1: The Manhunters inform Booster that they’re about to attack Captain Atom, giving him the opportunity to alert Atom, testing his loyalty. Page 6 – Panel 3: But Booster doesn’t care about the Captain. Page 6 – Panel 5: And here is the Captain, ruminating on his family problems, some of which are caused by . . . Page 6 – Panel 6: . . . General Eiling. Page 7 – Panel 1: Eiling informs Captain Atom that Firestorm has been spotted in the Louisiana bayou; Atom’s response about fighting Firestorm refers to a battle the two had in the pages of Captain Atom’s own book. Page 7 – Panel 2: As Atom says, he’s currently spying on his colleagues in the Justice League on orders from Eiling. Page 7 – Panel 3: Eiling mentions Amanda Waller’s team – that’ll be the Suicide Squad. In the previous issue during the Washington event (pages 11 to 13), both Eiling and Waller pretended that their heroes, Captain Atom and the Suicide Squad, weren’t getting involved in the Manhunter problem. 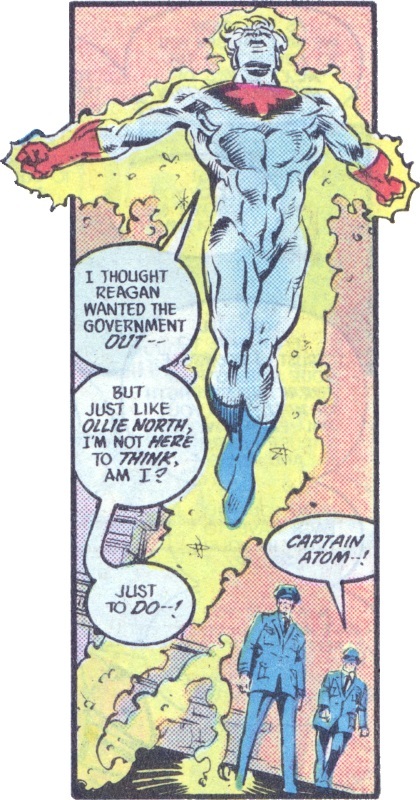 Page 7 – Panel 4: Captain Atom clearly struggles with being an obedient soldier, but accepts that he has to obey orders. His mention of “Ollie North” is in reference to the Iran-Contra Affair. The figure approaching in the bottom left is . . . Page 7 – Panel 5: . . . Harry Hadley, Eiling’s aide and the Manhunter agent assigned to Captain Atom that Booster Gold hassled in the previous issue. Page 7 – Panel 6: Hadley plans to appear on television and expose the secret Captain Atom Project to the world. Page 7 – Panel 7: Back with the Chosen. A quick recap, left to right, are Tom Kalmaku; Celia Windward; Takeo Yakata; Janwillem Kroef; Xiang Po; Herupa Handu Ho; Nadia Safir; Betty Clawman; (the following in the background) GL Kilowog; Green Arrow; GL Hal Jordan; GL Arisia; GL John Stewart; GL Katma Tui; Martian Manhunter; and Gregorio de la Vega. Page 8 – Panel 1: Herupa and Nadia give the Chosen one last chance to back out. Nadia mentions “the two who have died” which were Salima Baranizar who was killed in BLUE BEETLE #20 (covered in Crossovers Week 2), and Nikolai Latikov who was killed in the previous issue. Page 8 – Panels 2 to 5: Not much to say here as the Chosen all agree to continue, though Kroef is doing it to get his hands on power. Page 9 – Panels 1 to 4: Nothing much here, either, except to mention Xiang Po’s attraction to Takeo Yakata. Page 9 – Panel 5: Nadia staggers slightly. Page 10 – Panel 1: “I don’t miss much, Manh — Manhunter!” says Mr Miracle, who has clearly missed the fact that the Martian Manhunter shares part of his title with their current enemies. They’re both members of the Justice League and he only now notices that? Page 10 – Panel 2: Belle Reve prison where we find . . . Page 10 – Panel 3: Suicide Squad Assemble! Page 10 – Panel 3: . . . the Suicide Squad. 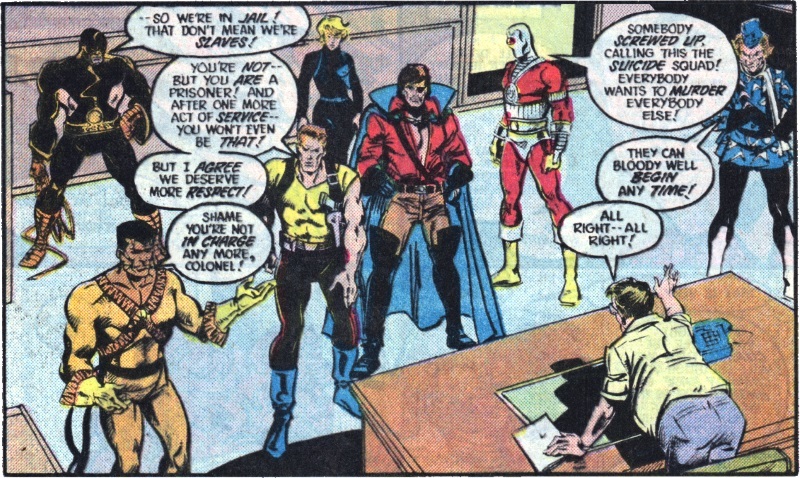 Left to right are Slipknot; Bronze Tiger; Rick Flag; Karin Grace; the Privateer; Deadshot; Captain Boomerang; and Warden John Economos behind the desk. Page 10 – Panel 5: Manhunters are shown outside Belle Reve. Page 11 – Panel 1: Economos mentions he’s requisitioned a boat for the Squad to search the swamp. Page 11 – Panel 2: Karin Grace does not normally accompany the Squad into the field as she’s a medic based at Belle Reve. Page 11 – Panel 3: Economos mentions the huge bomb they’ll be taking with them. Page 11 – Panels 6 and 7: Slipknot and Captain Boomerang decide not to go on the mission; Boomerang calls Economos an “imbo” which is Australian slang for imbecile. Page 11 – Panel 8: But Economos is not having anyone skip out on this mission. Page 11 – Panel 9: As Boomerang says, the bracelets to which Economos refers explode if the Squad members decide to bail. Page 11 – Panel 10: As Batman remembered earlier, the Privateer used to call himself a Manhunter, something that Boomerang finds very suspicious. Page 12 – Panels 3 and 4: The Privateer may or may not be as innocent and free of the Manhunters’ influence as he protests. The caption about him nearly destroying the Justice League refers to JUSTICE LEAGUE OF AMERICA #140 and #141 where the League faced him when he worked for the Manhunters. Page 13 – Panel 4: Why would a prison in a water based location need a boat…? Page 12 – Panel 6: Batman arrives from the Green Lantern Citadel to see the Privateer. Page 12 – Panel 7: And Economos flat out lies to Batman, telling him the Privateer has been released. Page 13 – Panel 1: Remember that boat Economos mentioned back on Page 11? Page 13 – Panel 4: Not only did Batman know he was lying, but he managed to read the paper showing the boat’s requisition which makes him suspicious. “Why does a prison need a boat?” he wonders, missing the point that the prison in question is based in a swamp and, should a prisoner escape and need to be found, land based vehicles wouldn’t be the only thing that would come in handy. Page 13 – Panel 5: A window advertising Madame Xanadu and her tarot readings. Page 13 – Panel 6: This seems a bit random; Xanadu has a Manhunter mask on display and ponders on how difficult it was to get it. 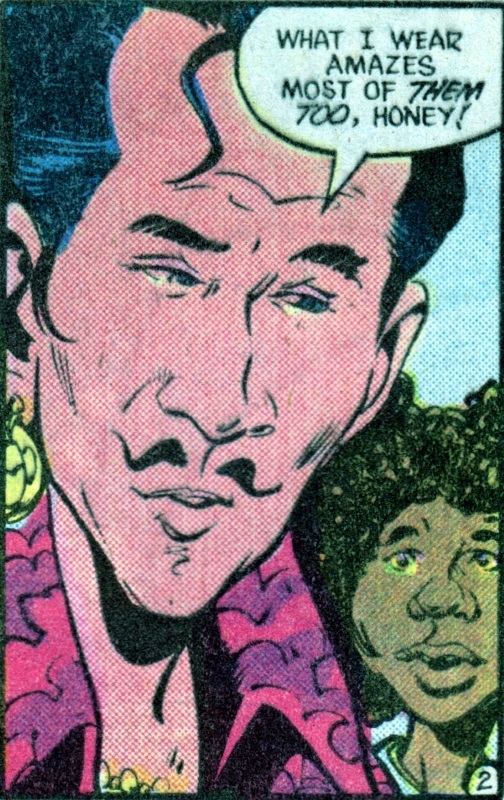 Page 14 – Panel 1: The bearded man is a Manhunter agent, last seen at the gathering of Manhunters back in issue #1. Page 14 – Panel 2: With the line “We most assuredly have business to transact!” either Xanadu is alluding to her knowing he’s an agent of the Manhunters or it’s just terrible dialogue. Page 14 – Panel 4: The card on the left is The Chariot, the one on the right might be The Magician or maybe The Hermit. Page 14 – Panel 5: The “tall, dark stranger” is likely to be either The Spectre or Batman. Page 14 – Panel 6: The bearded man asks about the Manhunters . . . Page 15 – Panel 1: . . . Xanadu turns over another couple of cards and comments on them . . . Page 15 – Panel 2: . . . and then offers to show him the mask she was looking at when this scene started. These three panels seem disjointed and oddly paced to say the least. Page 15 – Panel 3: That rare and difficult to find mask she was talking about on Page 13 – Panel 6? She’s just going to show it to the first stranger that wanders in to her shop. Page 15 – Panel 4: The agent knocks her unconscious. Page 15 – Panel 6: This is Kim Liang and Jim Corrigan, At this point, Corrigan works as a private detective and Kim is his assistant/secretary. Page 16 – Panel 1: I think that amorphous green blob is meant to be a mystical hand beckoning Corrigan and Kim into Xanadu’s office. Page 16 – Panel 5: Clobbering time! Page 16 – Panels 2 and 3: They rouse Xanadu who informs them of the Manhunter in Corrigan’s office. You could ask how she knows he’s there as she’s been unconscious for a few minutes, but hey, she’s a mystical being . . . Page 16 – Panel 5: Xanadu’s odd behaviour is explained as being her knowing she would be attacked and allowing it to happen. Page 16 – Panel 6: Corrigan finds the agent now wearing the mask and rifling through his papers. Page 17 – Panel 7: The agent asks about the Spectre – traditionally, the Spectre is seen as the other half of Corrigan but during this time they act as separate entities. Page 17 – Panel 2: The agent gives the Manhunters’ slogan a new twist. Page 17 – Panel 7: After the agent escapes, the Spectre arrives, eager to look after Madame Xanadu. Page 18 – Panel 2: The four of them gather around a table to divine the agent’s destination. Page 18 – Panel 4: The Spectre cries “Enough!” with obvious impatience . . . even though he’s the one who has been doing all the talking. Page 18 – Panels 5 and 6: The globe reveals the agent’s heading for the Louisiana bayous. Page 19 – Panel 1: Following her arrival on the Manhunter world and the battle with the androids as shown in the previous issue, Harbinger was captured and is now being held in an energy depletion chamber. Page 19 – Panel 2: Helping save the universe refers to her role in CRISIS ON INFINITE EARTHS. Page 19 – Panel 3: The Grandmaster arrives to do some taunting. The document containing the secrets of Earth refers to the History of the DCU Orb that Harbinger created and which she sent into space, unwittingly sending it straight toward the Manhunters’ home-world. Page 19 – Panel 4: The Grandmaster drops a key . . . Page 20 – Panels 2 and 3: . . . which Harbinger is able to get, eventually. Page 20 – Panels 4 to 6: Harbinger feels her strength returning but not before she is surprised by a Manhunter android. Page 21 – Panels 1 to 4: Harbinger’s escape attempt comes to an abrupt end when she is herded through an air duct that ends in a room where the Grandmaster waits for her. Page 21 – Panel 5: It is clear from the Grandmaster’s words that the key was dropped deliberately just to allow her to escape so that the Manhunters could hunt her. Page 21 – Panel 6: This is the Green Lantern Driq, his emaciated appearance due to the fact that he has died many times and been reconstituted by his power ring. Page 21 – Panel 7: Back on Earth we find the Floronic Man complaining about the amount of talking being done. Page 22 – Panel 1: He’s joined by the punk-haired Manhunter agent last seen at the gathering in issue #1. Page 22 – Panel 2: It should come as no surprise that the Manhunters are using the Floronic Man as a mole, a spy within the ranks of the Chosen. Page 22 – Panel 3: Batman learns that the boat that was requisitioned by Economos back on Page 12 was picked up by a group of “strange-lookin’ fellas” including one with an eye-patch, leading him to think it’s the Privateer and his Manhunter friends. Page 23 – Panel 1: Batman heads into the swamp, determined to find the Manhunters. Page 23 – Panel 2: And so is the Suicide Squad. Page 23 – Panel 4: And so are Jim Corrigan and the Spectre.